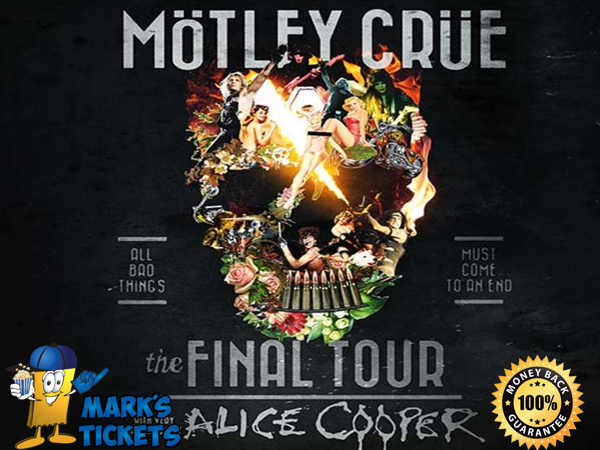 Mark's Tickets is the best place to find tickets for Motley Crue fans. Just check this page for any new events or schedule updates throughout the year. We sell tickets to every Motley Crue concert around the world. We know how passionate Motley Crue fans can be about pop & rock music, so we make sure to have hundreds of tickets for every concert available right up until showtime. For those looking for cheap Motley Crue tickets, we offer tickets starting at very low prices (many times below face value). We offer tickets in most sections of every venue that Motley Crue performs. Simply choose the city or venue that you are interested in below, and you will be able to see all of the available seats. Do not forget that Marks Tickets also specializes in sold out Motley Crue tickets. No longer will sold out shows prevent you from seeing Motley Crue. Mötley Crüe is an American heavy metal band formed in Los Angeles, California, in 1981. The group was founded by bass guitarist Nikki Sixx, and drummer Tommy Lee, who were later joined by lead guitarist Mick Mars and lead singer Vince Neil. Mötley Crüe has been described through the years as the World's Most Notorious Rock Band and one of the world’s best-selling groups of all time, having sold 75 million albums, and 25 million in the U.S. The band members have often been noted for their hedonistic lifestyles and the persona they maintained. All of the original members have had numerous brushes with the law, spent time in prison, suffered from alcoholism, suffered from long addictions to drugs such as cocaine and heroin, had countless escapades with women and are heavily tattooed. Their ninth and most recent studio album, Saints of Los Angeles, was released on June 24, 2008, and was certified Gold in January 2012. Mötley Crüe are working on their tenth studio album, and will embark on a farewell tour following its release before retiring. Mötley Crüe was ranked tenth on MTV's list "Top 10 Heavy Metal Bands of All-Time" and ninth on "VH1's All Time Top Ten Metal Bands".